I walked the last 10km, and with 2600 athletes and 100,000 spectators (who I sometimes wished weren’t there during that 10km walk) I was asked many times, are you ok? What happened? Yes I am ok. My legs shattered and I couldn’t run for the pain. And I’m happy with this. Because I swam well on very little swimming, I rode very well on very little riding, and I was in 2nd place at 18km on the run with little effort. “Well it’s easy to ride well if you blow on the run, and run well if you walk the last 10km” I hear you say. And yes it is, but on the training that I have done, I was happy to make it that far into the race at the pointy end of field. It speaks well for the type of training I have been doing on the bike, and also my run. More time is all I need to build the resistance, stamina, and strength in my muscles so they will last the full distance. “So why make excuses for not training? Why didn’t I just train more? Good question. And it partly relates back to my previous blog about how I am happy to spend time on the other part of my career. The appearance and promotional side. Had I been solely focused on winning here I would have skipped Honu and Cairns 70.3, stayed at home, got more than 2 long rides and at least 1 long run. I had had an injury up until mid April, so my preparation time was always limited, but I really wanted to go to those other events as the current World Champion. And I’m glad I did. 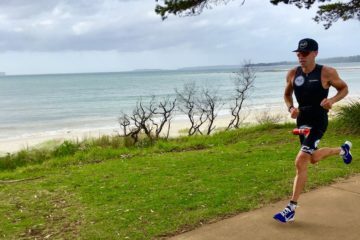 The swim went well, a big front pack an lots of jostling for position, and a big pack as we hit the bike – it reminded me of Kona. Except here, Marino was there with us out of the water and hit the front quickly. I tried to go with him, so did Eneko, but we couldn’t hang on, I fell back to the pack then we reeled in Eneko. I spent lots of time in the first 100km on the front, then dropped back and was surprised to find we had shrunk down to 5 riders. There were some surges by Andi and Eneko and around 140km we dropped Micheal and were down to 4, four and a half minutes behind Marino at T2. I was really happy to have played a part during the bike and be off the bike in equal second, and with a small group. Eneko ran well, as did Jan and Axel, I moved into second at 16km then blew at 18km. By 30km I had to walk. My legs were killing me and I couldn’t run. It was a very long 10kms, which felt terrible, then good, then terrible again. Very happy to finish, validate my Kona slot, and not have dug too deep that might have left me depleted for a month. Looking at Sebastian and Micheal as they crossed the line I’m kind of glad I wasn’t able to push myself like they did. Kona training starts in a week. I can’t wait to finally get in great shape for the first time this year, and nail it on October 12. Funny thing. My time of 9:33 is the same as my time for my first Ironman when I was 20 years old. Congratulations to everyone who finished. It got really hot out there, and there was a bit of headwind on the bike. Loved the course. Loved the crowds. Unbelievable finishline! And big congratulations to the Spanish stallion Eneko Llanos for winning his second Championship Ironman, and 3rd Ironman for 2013. What a stud. I have a feeling he will be back on the podium in Kona. Thanks for blogging about today’s race Pete. It was certainly a tough day at the office but I’m glad you pushed through and decided to complete the race. I’m sure you’ll do great things later this season, don’t lose focus and stay positive! Cheers! You never have to “explain” yourself to anybody! As an Ironman World Champion, I think that gives you the right to choose how you spend your time! Be it training, spending time with family or building your brand, that’s your call. As for the people “questioning” your time commitments, well, let them talk when they can say they won Kona!